To those unfamiliar with it, The Gong Show was basically a loopier version of America’s Got Talent that ran for a few years in the late ’70s. (It was also one of Homer Simpson’s many lifelong dreams to appear on it.) That’s right: Goofy talent shows are not the sole province of budget-minded networks in the new millennium. Like America’s Got Talent, The Gong Show was frequently unwatchable. 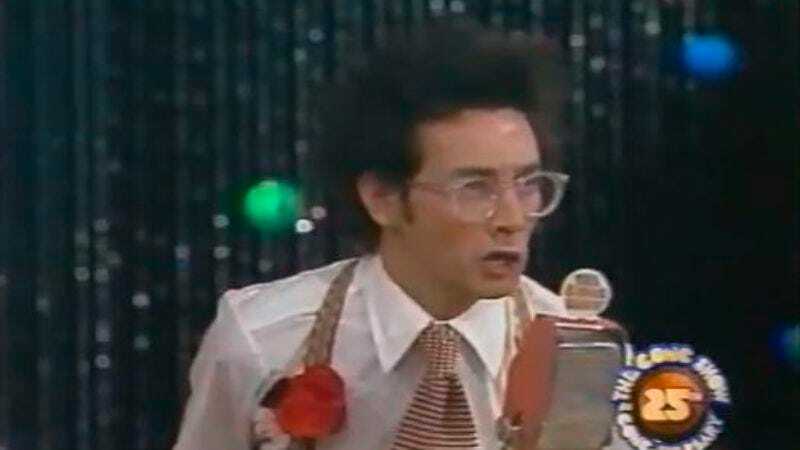 But the show’s archives have some interesting stuff, like Paul Reubens and fellow Groundling Charlotte McGinnis as sound-effect duo “Betty And Eddie” in 1977. Skip ahead to the 11-minute mark to see their performance before the esteemed panel of singer and ’70s-game-show mainstay Jaye P. Morgan, Arte Johnson of Laugh-In fame, and Steve “Mr. Clean” Garvey of the Dodgers.